Final results from the National Grass Trials were published in HortTechnology in October 2017. The first national grass trial has been completed and results were published in the October 2017 issue of HortTechnology. Data from 2012-2015 can be found below for the 11 locations that participated in the trials. The National Grass Trials at Colorado State University has attached the final 2015 data with both a full report and averaged data. All of the grasses did well this year, despite numerous adverse weather conditions such as extreme weather event where temperatures plunged from the mid-50’s to -16 degrees F in 24 hours in November 2014. We also had an abnormally wet May 2015, with over 6 inches of rain that month and I late hard frost on May 10. 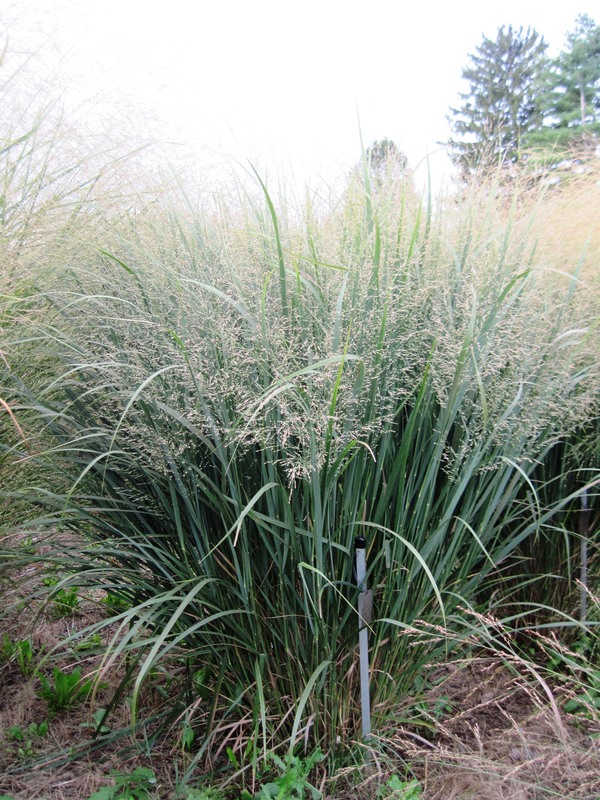 The best performers for 2015 were Shenandoah and Heavy Metal , Panicum virgatum (Switchgrass) cultivars and Schizachyrium scoparium ‘The Blues’. No disease or pests were noted in the three trial years, with minimal plant loss. Posted on November 2, 2015	by Barrett W.
During the recent growing season, the grasses at Longwood Gardens stretched and lodged more so than in the past. This is possibly due to the abundant rainfall in spring and early summer. Consequently, overall scores were a bit lower. ‘Northwind’ and ‘Shenandoah’ were among the top performers in 2015. Both maintained an upright habit with little to no lodging and generally performed as expected with respect to size, habit, and color. This past winter was the best test winter yet for hardiness, plants experiencing some of the coldest soil temperatures in at least the last three decades (as long as I’ve been monitoring soil temperatures). In my northern Vermont trials site, we once again were zone 4a, with 4 days in Feb, -20F (air) or below, with -27F (air) on Feb. 24. In colder years of the past, soil temperatures on average reached 28F, perhaps a few days to 25-26F in colder winters. In several recent winters, soil temperatures seldom dropped below 32F. This past winter, soils were 28F or below 21 days in January, and 16 in February. Of these, soils reached 25F or below 17 days in January and one day in February. Of these latter, soils reached 22F or below 6 days in January, the coldest being 17F on Jan. 18. It was a good test “spring” for plants too. As they were getting unhardened we had 6 days the last couple weeks of MARCH with air temperatures 10F or below, reaching 0F on Mar. 24! Four days the end of March we had SOIL temperatures 28F or below, with 22F (as in January, the lowest in over 25 years) on Mar. 23. So it was amazing that as many grasses survived as did. 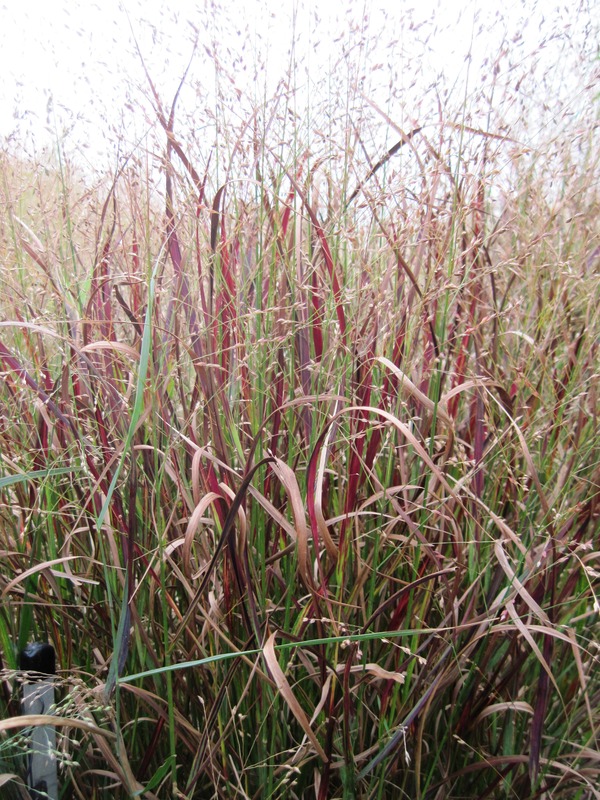 Several switchgrass (Panicum) cultivars in which new plants had been replaced fall 2014 had several die. Of those living, overall results were similar to the previous year, only with slightly more growth (a bit higher and wider), and a bit better floral display on several cultivars. Most cultivars that had several plants were quite variable in growth, as in the past, among the plants. Most uniform among all plants of a cultivar were Dewey Blue and Prairie Sky. Overall best, s imilar to 2014, were Northwind, Prairie Sky, and Shenandoah. Also good this year overall was Rotstrahlbusch. one plant each were outstanding too of Rehbraun, Thundercloud, and Trailblazer (not officially in trials, and only one plant). 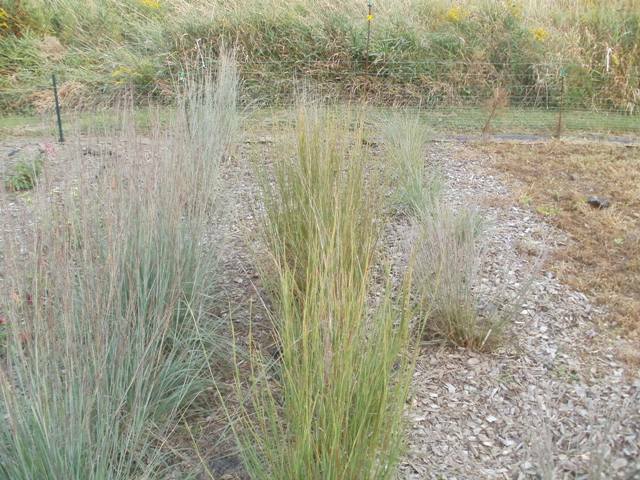 Little Bluestem (Schizachyrium) cultivars survived much better. Best overall as in 2014 was Blue Heaven, but joining it among the best this year was Blaze and Standing Ovation (added in 2014, not officially part of the trials). All plants of each of these three cultivars not only survived, but were uniform among plants. Standing ovation at about 50cm high was half the height of the other two. Prairie Blues fared the worst, only one of the four plants surviving and rating only average.